Both Irma and Emerson are dear to the Center. Irma volunteers with FamilyPoint Resources and the Center, and Emerson handles all the maintenance at the Center. 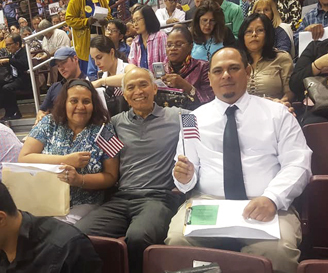 They both went through CrossWalk Houston’s Citizenship class, and they are now U.S.A. citizens! We so proud to have them in our community and now as citizens! Irma said she was so nervous, but she passed 100%! CrossWalk Houston, housed at the Center, offers adult education classes such as GED, Citizenship, and other educational programs for adults of culturally diverse and socio-economics groups. The Outreach Center of West Houston is more than just a building. It is a place where people find hope and healing for their lives through the many non-profit programs that call OCWH home. We are grateful to be a part of their story by continuing to provide a low-cost, safe, clean, and welcoming environment for them to serve our community. As we are a non-profit organization serving other non-profits, we are solely supported by committed and loyal donors through sponsorships, single donations, and fundraising events.